Figure 7-27. 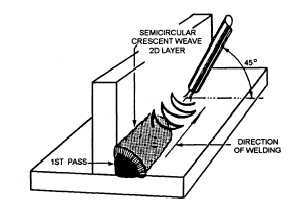 - Weave motion for multipass fillet weld. Figure 7-28. - Order of making string beads for a tee joint in heavy plate. Figure 7-29. - Intermittent fillet welds. Figure 7-30. - Tack welding a lap joint. Figure 7-31. 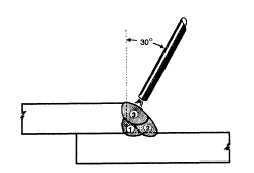 - Position of electrode on a lap joint. 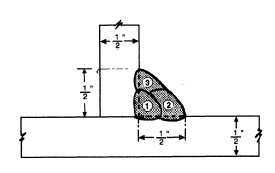 strength to that of a joint that has a fillet weld along the entire length of one side. 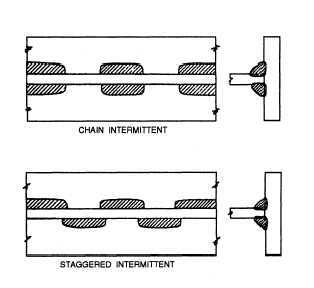 Intermittent welds also have the advantage of reduced warpage and distortion. LAP JOINTS. 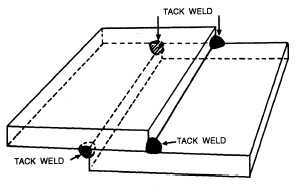 - When you make a lap joint, two overlapping plates are tack-welded in place (fig. 7-30), and a fillet weld is deposited along the joint.